Happy New Year! I know, I know. It’s been a while since I’ve written. A long while. Life kinda got crazy. So where should I start? Let’s start at the very beginning and recap 2013. This time last year I was studying British theatre in London and it was fabulous! (Wow! I can’t believe that was a whole year ago!) In the spring I interned at Parenting.com, acted and costume designed for some school plays, and enjoyed my last semester of college. In May I graduated from The College of New Jersey and got my B.A. in Journalism and Professional Writing. (Yay!) In the summer I worked at a theatre camp and directed Beauty and the Beast, Jr. The kiddies were ah-dorable. Towards the end of the summer I was cast in a local production of Avenue Q. I learned how to puppet….then I kinda disappeared. Oops. Sorry about that. Let me explain what happened. 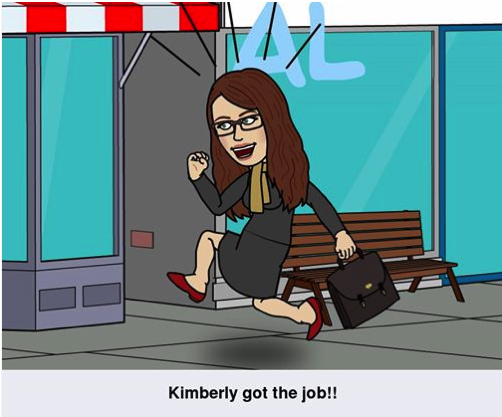 Well, while I was in rehearsals for Avenue Q, I got my first real big-girl job! In New York City! 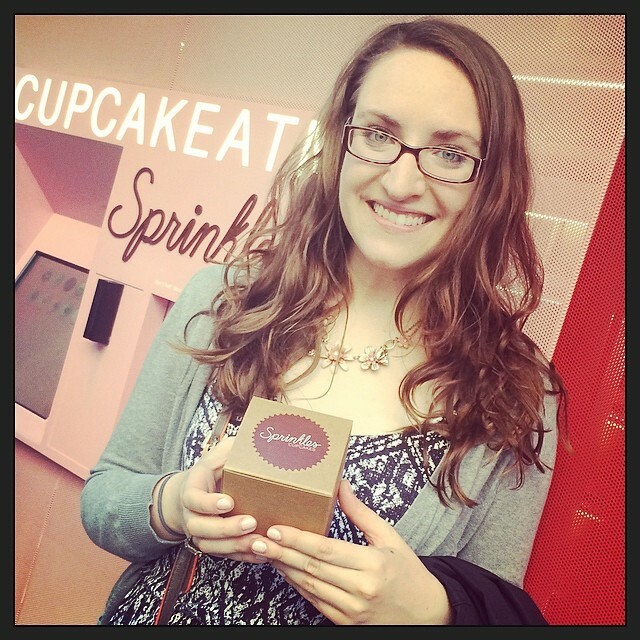 I started working as a Community Manager at an advertising agency doing social media for BlackBerry. It’s all been very exciting… and completely exhausting. See, I live in New Jersey. South Jersey, to be exact. I’m about 10 minutes outside of Philadelphia. So New York City is a bit of a hike from my neck of the woods. For the past few months my life has been a bit of a whirlwind. 8:32 a.m. – get to office feeling cold and out of breath, it’s time to start a full day of work! This is an ideal day. Some days I miss the express train and need to wait around for a slower, local train. This can add 30+ minutes to my train ride and it’s the worst. But I digress…Back in November, Avenue Q ended after a lovely 4-week run. I would finally have time to myself! (Or so I thought.) I auditioned for another play the day after Avenue Q closed and was cast on the spot. While this was kinda awesome, it also gave me zero time to relax after Avenue Q. I literally went from a performance, to an audition, to a rehearsal in a matter of 24 hours and I’ve been in rehearsals ever since. This new play, “Mama Won’t Fly” opens in 3 weeks and I am so excited for opening night! It’s a very funny play and I have a great part in it. I’m playing Hayley, a high-energy, accident-prone, bride-to-be. It’s such a fun part and I’m so happy. But this lifestyle isn’t sustainable. During the week I feel like I’m living in a constant state of commute. On the weekends all I want to do is sleep. Something’s gotta give. So once the play is over I’M MOVING TO NEW YORK! I don’t know exactly where I’ll be moving, but I’ve been looking for apartments in Queens and Brooklyn. My goal is to be all moved into my new apartment by March 1! 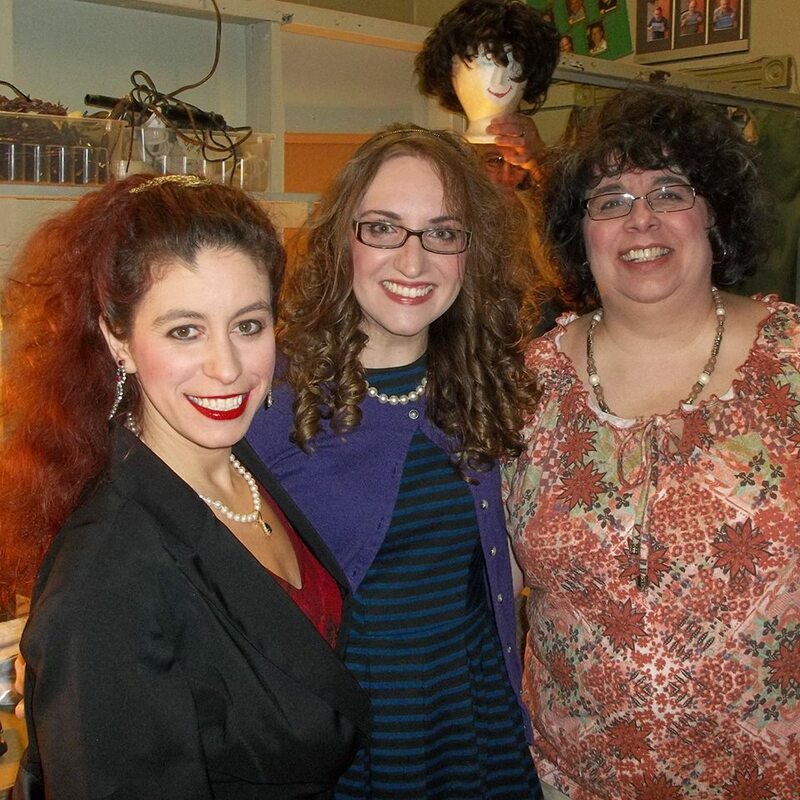 Once the play is over, I will focus all my energy into finding an apartment and making this exciting move! For a Jersey girl (born and raised) this is a HUGE step for me. Heck, I even went to The College of New Jersey. I think it’s time to give one of the other 49 states a chance. I’ll hopefully be able to give you a more detailed update on my new play and this exciting move to NYC sometime this weekend, but considering my track record, I won’t make any promises. Hope everyone had a lovely 2013 and I wish you every bit of happiness in 2014! I’d like to introduce you to someone very special. 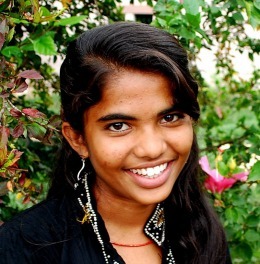 This is Nagendri, an 11th grade She’s the First scholar from India. Just like me, Nagendri loves to read, sing & dance! She dreams of becoming an Indian Administrative Services officer once she graduates so she can help others break out of poverty. She rocks! Nagendri attends the Shanti Bhavan school in rural India, an institution that provides its students with a world class education free of charge. I helped co-sponsor Nagendri’s tuition by hosting a Zumbathon at my school this spring! Each year, volunteers from around the world host creative fundraisers to sponsor the education of She’s the First scholars. 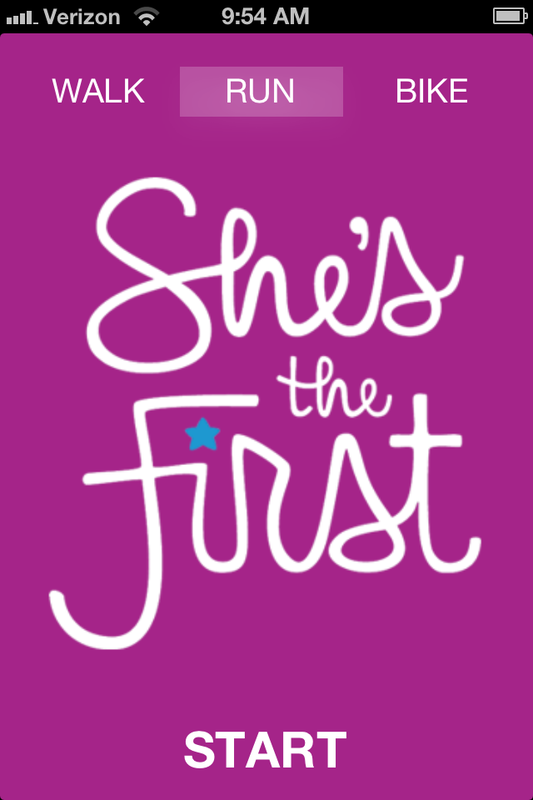 She’s the First is a non-profit organization that sponsors girls’ education in developing nations by encouraging volunteers to organize creative fundraisers. Like all She’s the First scholars, Nagendri will be the first in her family to graduate from secondary school! For the past week I’ve been learning the music for my latest show, Avenue Q. I haven’t performed in a musical in two years, so I’m thrilled to be singing again. The music rehearsals have been a blast so far, but the music is slightly more challenging than I would have expected. 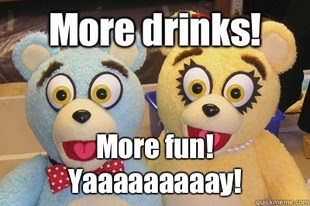 Since Avenue Q is a silly show filled with catchy songs, I assumed the music would be a breeze. (I mean, my character is a puppet for goodness sake!) But despite the ridiculous laugh-out-loud funny lyrics, I found that I’ll really need to work hard to make sure I sing everything perfectly. “There is life outside your apartment! You’d never know it just from reading the lyrics, but we’re actually singing in four-part harmony there. I’m really enjoying learning the music for this show because the songs are so catchy, plus I get to sing in a puppet voice which is really fun. I’ve been drinking a TON of tea with honey this past week to try and preserve my voice. 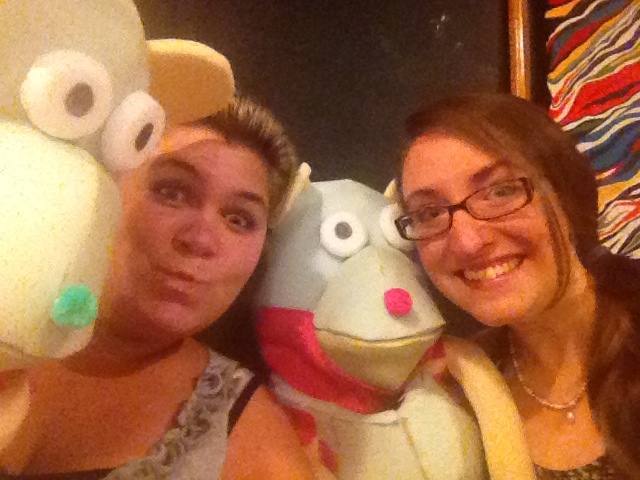 Singing in a puppet voice can really take a toll on your vocal cords. This week we were given our “rehearsal puppets” to start practicing with. The rehearsal puppets have the same feel and weight as puppets we will use for the performances, but they are for rehearsal purposes only and do not leave the theatre. I loved practicing with my rehearsal puppet, but my hand was very sore by the end of practice. I definitely need to build up my strength before opening night! Do you have any questions about the rehearsal process for a musical or about working with puppets? I’d be happy to answer any questions you may have! Feel free to leave a comment below. Even though Beauty and the Beast, Jr. closed about a month ago, that didn’t stop me from having a nightmare about Belle missing her entrance the other night. I can’t seem to get this show out of my head! The week of the performances I pretty much went insane from the stress. Below is photo documentation of my downward spiral into insanity during show week. 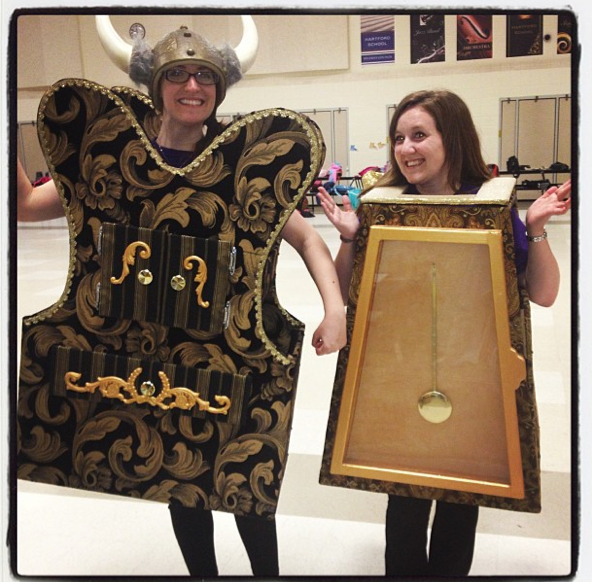 Co-Directors dressed as Wardrobe and Cogsworth! Usually, directors get to sit back and enjoy their work during show week, but that is not that case when you’re directing a children’s production. Because of the neediness of pint-sized actors, I was needed backstage during all the shows so I could move set pieces and help Belle with her many costume and wig changes. At times it felt like I was like trying to tame a herd of wild elephants. Those kids LOVE to stand in the wings (in perfect view of the audience, mind you) to watch the show and discuss the on-stage action with their friends. One of the first rules of theatre is to stay quiet backstage, but the kids just couldn’t stop talking. In addition to playing “angry librarian” by shushing the kids during the performances, I also sang harmonies from backstage to help out during group numbers. By the end of each performance I was exhausted! Each show had its own set of hiccups, but that doesn’t mean that the kiddies didn’t do a great job! In live theatre, especially in children’s theatre, there is no such thing as perfection. Lines were dropped, entrances were missed and the occasional costume piece fell off. (I’ll never forget the horror of watching Beast’s mask fly off his face mid fight scene!) Luckily, the kids are adorable, so they can pretty much get away with any mishap. Overall, I’m very proud of the kids and what we were able to accomplish with the show. Beauty and the Beast is, by nature, a VERY technically challenging show, but the kids rose to the challenge. I would love to be a part of this show again someday, as it is still one of my favorites, but I’d definitely prefer to be a part of a production with adults! Directing Beauty and the Beast was a great experience and the kids filled my summer with magic! Here’s to another great show! In case you missed my last post, this summer I’m co-directing a production of Beauty and the Beast, Jr. starring some adorable kiddies. The past two weeks have been going fairly smoothly. My co-director and I are just about finished blocking all the scenes. For those of you who aren’t familiar with theatre lingo, blocking is any movement that a director assigns to an actor while on stage. This is different from choreography which are the dance movements given to an actor during a musical number. One challenge that I have come across during this process is getting the kids to be quiet while I am trying to teach the blocking or rehearse lines with the actors. When the kids aren’t working on something specific they tend to get antsy. I guess this shouldn’t be a surprise — they are kids after all! Working with kids is very different from working with college students. Children tend to upstage each other (stand so far upstage that they force the other actor to turn their back to the audience) and direct others. A big “no-no” in theatre is when one actor tries to direct another actor. 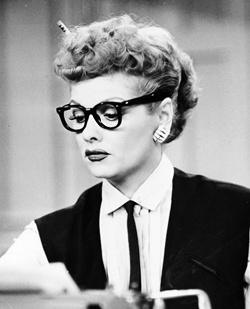 The only person who should be directing is the director. One of the highlights of camp was last week when a fight choreographer visited to teach the kiddies (and counselors!) stage combat. As a female, I haven’t had much experience in stage combat (why are all the good fight scenes between guys? ), so I was very excited to learn. Unlike normal fighting, stage combat is all about safety. We learned the “DEPP” method which stands for: Distance, Eye Contact, Preparation and POW! When doing stage combat, it’s very important to have space between you and your partner. For many of the moves you don’t make physical contact with your partner at all, but from the audience it looks like they are getting hit. Eye contact is also important because it ensures that your partner is paying attention so neither of you get hurt. The preparation allows your partner to have time to react and makes the movement visible to the audience. The final step, POW, is the actual motion, whether it be a punch, kick, throw or hair grab, as well as your partner’s reaction to the motion. We learned that in many cases the reaction is even more important that the punch, kick, etc. because it helps “sell” the motion to the audience. For example, if you threw a great big punch, but your partner just stood there like they were completely unfazed by it, you would look incredibly weak and pathetic. On the other hand, if you threw the same punch and your partner fell down and cried out in pain, you would look strong and powerful. Ah, the wonders of acting! During the stage combat workshop I got to *kick, punch, strangle, throw and pull the hair of children. It was amazing! Tomorrow the fight choreographer is coming back to help us stage the fight scene between Gaston and Beast at the end of the play. I’m really excited to learn some more stage combat and to see how the scene turns out! This week I started my job at a local theatre camp! It’s my second year working at the camp and I’m so happy to be back. I am one of the three senior counselors in charge of 51 kids ages 5-14. This year the campers will be putting on Willy Wonka, Jr. and Beauty and the Beast, Jr. I’m excited to be co-directing Beauty and the Beast with another senior counselor. Beauty and the Beast is my favorite Disney movie and I’ve always wanted to work on this production! Monday was the first day of camp and we started off by having the kids do some ice-breakers to learn each other’s names. After that we taught the kids stage directions with a game of Simon Says. By the end of the day all the kids knew the differences between Stage Right, Stage Left, Center Stage, On Stage, Off Stage, Up Stage and Down Stage. Afterwards we listened to the music from each show and selected the music that they’d need to know for their auditions. Girls auditioning for Belle need to sing Something There starting at “New and a bit alarming…” The boys could choose between a section of the song Gaston or the Beast’s part in Something There. Girls auditioning for any part could sing the selection from Gaston. On Tuesday we had the kids do some scene work. We split them into groups and had the counselors assign them different scenes to read. I was blown away by my group! They were all excellent readers and took direction very well. In the afternoon we started our audition process. We called the kids into the hallway one-by-one to sing the song of their choice. After they sang we had them do cold readings from the scripts. We didn’t get through all the auditions on Tuesday so we had to finish on Wednesday. Our choreographer taught the kids a short dance routine to Be Our Guest while the senior counselors conducted the auditions. Auditioning and casting 51 kids was way more difficult that I ever could have imagined. The kids are immensely talented, but it is tough to figure out what parts they can handle. The cast list wasn’t sent out until around midnight on Wednesday because it took so long to finalize! I’m really excited to start blocking the show next week! On Thursday (July 4th) we didn’t have camp, so I spent the day brainstorming how I want to block Beauty and the Beast. I’m most looking forward to blocking the Prologue. Even though I’m not a dancer, I want it to be like a ballet with very exaggerated movements. Our Enchantress is an excellent dancer and I definitely want to take advantage of that. On Friday our camp took a trip to New York to see Matilda on Broadway and to do a workshop with one of the members of the cast. The kids learned Miracle, the opening number of Matilda, and were taught a short dance routine to go with it. Some of our kids are such great dancers! For lunch we ate at the Hard Rock Cafe and then we saw the 2:00 performance of Matilda. The show was excellent, but I think I liked the London cast slightly better. Friday was a looooong day, but we had a great time. 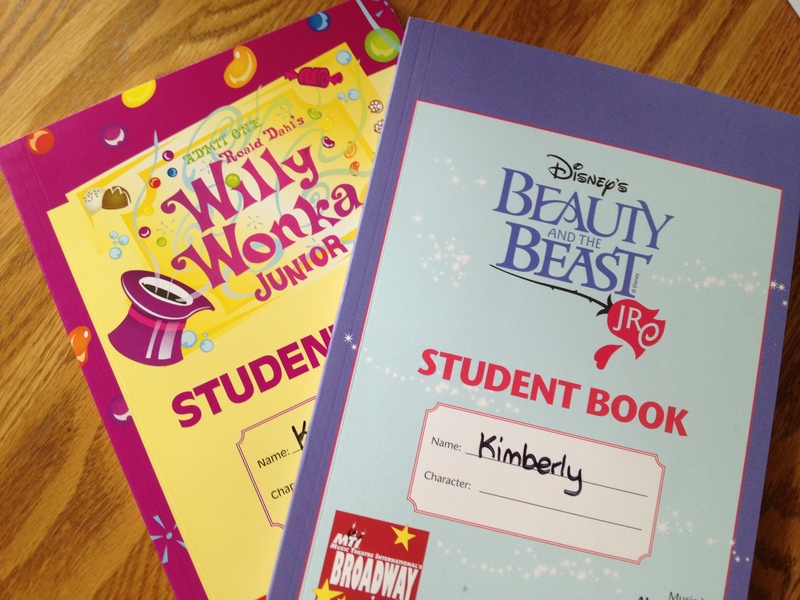 I’m really looking forward to start working with the kids next week so we can make such a magical show come to life! Yesterday I took a lovely trip to New York City to visit two of my very best friends, one who lives in North Jersey and another who was born and raised in the City — lucky girl! We shopped, dined and chatted for hours. I’m a firm believer that your true friends are those who make you laugh the loudest, and these two had me in hysterics all night. 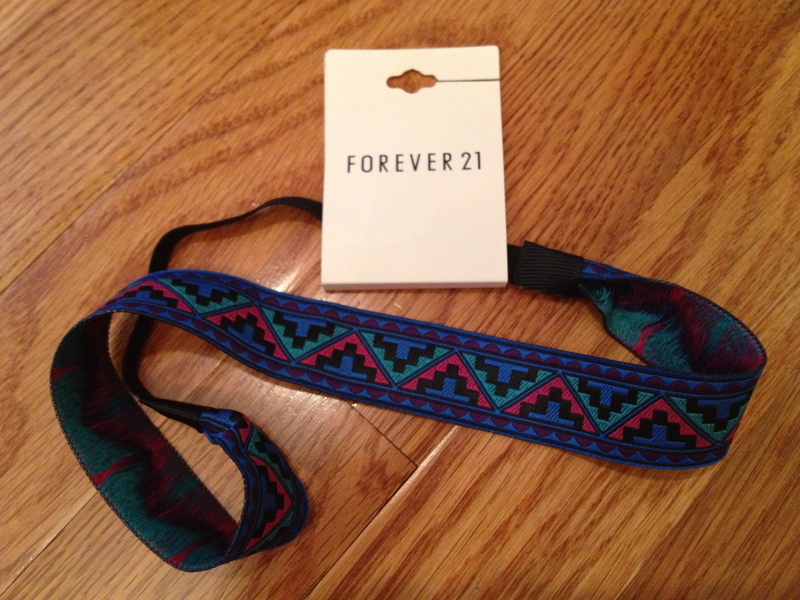 I must say that we did more chatting and laughing than shopping, but I did make some fabulous purchases at Forever 21. And get this — I spent less than $15! (You KNOW I love a good bargain!) So without further ado, here’s my Forever 21 Haul. Aren’t these fun? I’ve been wearing the same tired sandals since last summer and I’m thrilled to have found a bright new pair to replace them. I have a sad habit of wearing the same pair of shoes over and over again until they’re destroyed and unwearable. Since these came in a bunch of other colors, I’m thinking of going to the Forever 21 near my house to pick up another pair! Admittedly, I wasn’t actually in the market for a new headband, but once this little beauty caught my eye I couldn’t let it go! I’m not sure what I’m going to wear with this just yet, but I have a feeling it’s going to be a great outfit. Who knows, maybe I’ll need to go on another shopping trip just to find the perfect look! What do you think of my new finds? Leave a comment below!